ABSTRACT: Nutrients loading reduction in watershed is essential for lake restoration from eutrophication. The efficient and optimal decision-making on loading reduction is generally based on water quality modeling and the quantitative identification of nutrients sources at the watershed scale. The modeling process is influenced inevitably by inherent uncertainties, especially by uncertain parameters due to equifinality. Therefore, the emerging question is: if there is parameter uncertainty, how to ensure the robustness of the optimal decisions? 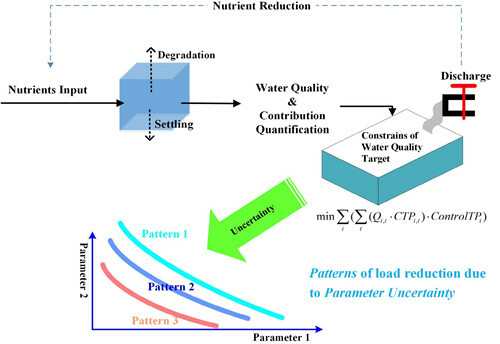 Based on simulation-optimization models, an integrated approach of pattern identification and analysis of robustness was proposed in this study that focuses on the impact of parameter uncertainty in water quality modeling. Here the pattern represents the discernable regularity of solutions for load reduction under multiple parameter sets. Pattern identification is achieved by using a hybrid clustering analysis (i.e., Ward- Hierarchical and K-means), which was flexible and efficient in analyzing Lake Bali near the Yangtze River in China. The results demonstrated that urban domestic nutrient load is the most potential source that should be reduced, and there are two patterns for Total Nitrogen (TN) reduction and three patterns for Total Phosphorus (TP) reduction. The patterns indicated different total reduction of nutrient loads, which reflect diverse decision preferences. The robust solution was identified by the highest compliment with the water quality at monitoring stations that were reduced uniformly with this solution. We conducted a process analysis of robust decision-making that was based on pattern identification and uncertainty, which provides effective support for decision-making with preference under uncertainty.